We have a huge sage bush into our garden, so I have to keep inventing dishes to make use of it. Fry the bacon on a medium heat until its fat has melted. Add the butter and the sage and fry until the sage is crisp. Remove from the pan, retaining the fat in the pan, and set aside. Add the squash and the cream to the pan, reduce the heat and let it simmer away for 5-10min or until the squash is tender. 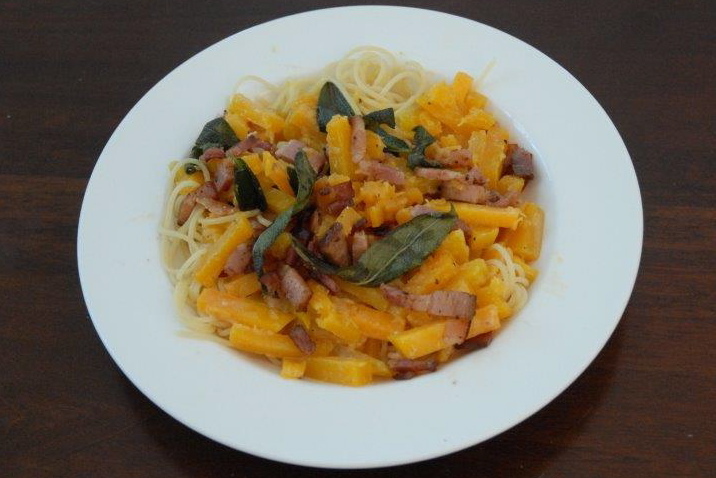 Serve with cooked pasta and grated parmesan.